When the Disney movie Ratatouille came out, I wondered what on Earth could be so special about ratatouille. It sounds like it could be a pasta dish, though it isn’t, so I was picturing a rotini with squash or something. As it turns out, the results were better than i imagined they would be. Paige ate it right up. 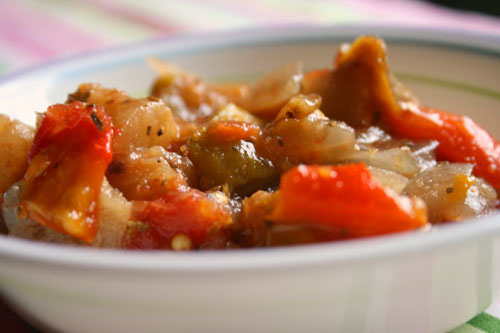 When a ratatouille is made as it should be, it is a casserole of cooked vegetables in which each of them retains its shape and its own special character. This isn’t the classic method for cooking this dish, but it does remain somewhat true to its heritage. I used a red onion in place of a yellow and summer squash in place of zucchini, out of necessity. It came out well, nonetheless. I wonder what Julia would say? As for the leftovers? It’s quite tasty cold. You could eat it just like that or drizzle with a touch of good balsamic vinegar. Or you could even puree it, heat it up and eat it over pasta (pureeing optional). Set a colander over your sink. Add eggplant and salt generously. Let sit for one hour, draining. Pat with a paper towel and transfer to your crockpot. Add the onion, peppers, tomatoes and garlic. Pour in the olive oil and stir. Set the crockpot to low and cook for two hours. Add the squash, basil and pepper and stir to combine. Cook on low for an additional 2-2 1/2 hours, until all the vegetables are cooked through. I’ve always wondered what Ratatouille was like! I assumed italian and pasta-y also. I made caponata for the first time recently which actually sounds vaguely similar! 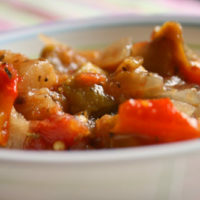 I love leftover ratatouille — I use it as a stuffing for omelets. That looks SO good. So funny, after watching the movie, I made the recipe just like the movie – time consuming, but it was good! Very different from traditional ratatouille. Also – the other day at brunch, I had ratatouille (like you made), in a puff pastry “container” of sorts and then topped with a poached egg and some sort of hollandaise-y sauce. We waited almost a hour for it, but it was SO worth it. This looks delicious and easy so I’m going to try it. 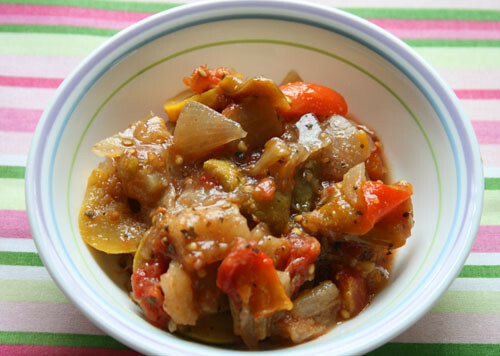 Other recipes for ratatouille have sounded so labor-intensive that it put me off trying it. I am also going to finally make time to see the movie! Maris, I know, right? Who knew? Lydia, that is a fantastic idea. I will have to try that next time. Maybe with a little mozzarella. VF – YUM! That sounds so amazing. I am on such a poached egg kick lately. Love them. Candelaria, thank you!! Let me know how you like it.